Detroit's witty and cunning rapper B-Rabbit, played by Doctor Dre's protege Eminem, dropped one of the most prolific freestyles I had ever heard in a movie back in 2002 when 8-Mile broke the box office. After recently spending some time exploring Detroit, I found myself repeating some of the lyrics from Em's famous freestyle battle against his rival rap crew Free World. What's the matter dawg? You embarrassed? Now when I first saw the movie I just assumed that Cranbrook was some fictitious private school made up primarily for a line in the movie, or at best, was some small uppity school where snobbish families sent their overly privileged children to get the best education money can buy. I soon learned that all of that was inaccurate. Cranbrook Schools, in reality, is one of the most beautiful campuses I've ever stepped foot on. 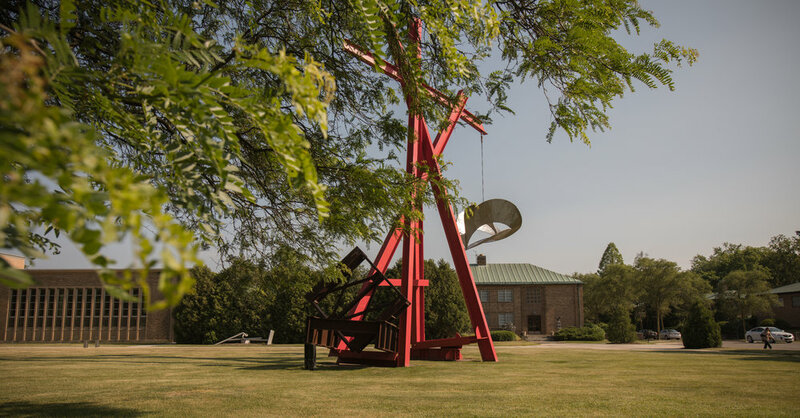 It's classified as a PK-12 college prep boarding school, recognized for their natural history museum, contemporary art museum, House of Gardens, and Graduate Art Academy, all of which are present on the school's 319-acre grounds. Frankly, my eyes weren't prepared to witness this seemingly foreign place that my Detroit homie casually took me to with the assumption that I'd be visually inspired by it. I can admit I was skeptical at first driving along the outskirts of the Bloomfield Hills school, but he was right, I was impressed. The gigantic sculptures, art, architecture, gardens, landscapes, fountains, ponds, and more, were all beyond belief. It must have been an ideal time to visit because there were no students, and visitors were scarce. The campus was peaceful, quiet, and filled with life. Words, of course, do Cranbrook no justice, so I've included some images of locations around the school. The children of Cranbrook have all-access privileges to catch these amazing views regularly and now you have access too. I guess Papa Doc did truly have luxuries the streets never knew about.